First lesson learned: just in time beats preparation. I used index cards, shuffled, to establish the initial order of match-ups. I had pre-written the cards for people who paid in advance, but a spilled cup of tea led to us having to re-do most of those as people registered. In the confusion, one (dry) card too many made it into the intermediate pile, leading me to be confused as to how many players I had. I should have had only one “play in” game in that bracket, but I set up two, and then had to balance it with a first round bye elsewhere! Major goof and my biggest regret from the event. Second lesson learned: you need to be very clear with people. Had a couple of completely preventable issues that arose due to poorly explained clock controls (2 points/game in the match means 22 minutes on the clock at the start of the 11 point match, not to reset the clock to 2 minutes each game… although that’d be an interesting variation…) If the player says “I’ll be back between X and X+1”, say “be back at X or else”, not “try for X”. Confusion leads to hurt feelings. I don’t mind hurting feelings, but I don’t want to do it unnecessarily. Third lesson learned: get buy-in. I had over 10 no-shows, only two of which gave me the courtesy of a note in advance. I had a few short of the walk-ins that I expected. So my mood was depressed by the swing from expected. I had told locals that they could just RSVP via meetup and pay day of, but that meant people were registering as a “yeah, I’ll maybe go do that” rather than really committing to the event. I’m still grumpy about that. Still, once we got rolling, it did go pretty smoothly. Financially, it looks like it’ll be close to a break-even, which met my expectations based on the numbers we had. We had 32 players, I figured break-even would be 30-35. I’m still waiting for the final bill from the hotel for coffee and set-up, but ball-park figuring those, we had $1400 in revenue from the event (hospitality fees + rakes from the various tourneys), and expenses of $1300 or so. I hope. If the bill includes two more gallons of coffee than I expect, expenses will exceed revenue! But some of those expenses are non-recurring for next year (spare boards, extra clocks) or for materials I can save to next year (still have about a third of the pens and about half the score pages). So even if the coffee bill puts me in the red for the event this year, I can think about amortizing those expenses over several years and claim a win. I was hoping to do a little better than that, as the club has been running in the red so far, but still… not a failed venture, not a home-run. I know some of what I want to do differently next year, and I plan to do a survey of the people who came to see what they want different as well. And in another 3-6 months, hopefully, I will have the energy to start planning again. We had a great turnout for the chouette today – 12 players over the afternoon, although no more than 10 at any one time. Newcomers Oggie, Oliver, and Nate had not done a chouette before, and so we set up a beginner’s table for $1/point, and the main table went for their usual $5-10/point. It occurred to me that a sport’s bar is really a perfect spot for the chouette, because they had about 7 different events on various screens, and it was totally not out of place for a table to suddenly erupt in a cry of joy and/or despair. 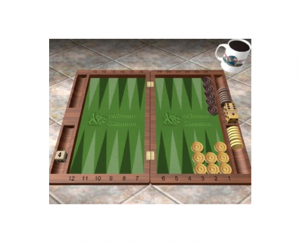 We had a lot of those for the backgammon games too, and more than once I found myself saying “all I need is a double <insert number here> or better…”, either to win or to save the gammon. I think I got my roll each time, too! This position came up in one game where Oliver was the captain, and we spent a solid 2 minutes debating. The debate was: 7/3(2) or 24/20(2). Turns out, we went with the wrong answer. Extreme gammon says it’s 7/3(2), and by going with 24/20(2), we made a -0.004 error. Which is to say, you couldn’t really go wrong with either of those plays. +0.934 equity or +0.930 equity – I guess one is slightly higher. I have a couple of other positions from my table where there was a doubling decision, but running them through Extreme gammon shows the answer we arrived at was not only right, but kind of obvious. Mark F sent me a couple of positions from the other table that were interesting. Brown was the box in our chouette yesterday, with white on roll. There were four 4-cubes on White’s side of the board. What is the cube action here? Note that brown has 8 checkers left on the one-point. In the actual chouette, all four team members doubled to 8. The box took all 4 eight cubes. The box lost, and questioned his take. But it was a very easy take, and in fact, it would be a huge blunder to drop. 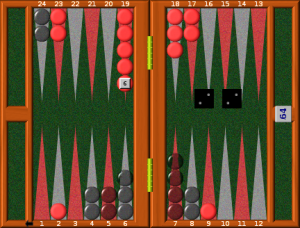 In fact, it was not a proper double, and white’s error was .045 by doubling (a fairly small error). Note that white will be very disappointed they doubled after white rolls a non-double and brown rolls any double. Also, if white rolls a 1 or a 2 (other than double-2), black still has a take next roll. After learning about the previous position through XG mobile shortly after that game, brown was reluctant to redouble. And he didn’t double. But actually, it is a clear double. And a double-blunder not to double! Here, brown can be off in 3 shakes without rolling a double, whereas white needs four rolls unless he rolls a double. That’s a huge factor. White barely has a take. The cube equity after white taking is .961, so it would only be a small error for White to pass. Lots of excitement was expressed about next weekend’s Portlandia Backgammon Classic, and I’m super pumped for it. Hope to see you there!